Find everything there is to know about acoustic ceiling tiles cost, installation. best tips as well as up to 4 free contractor quotes. Acoustic ceiling tiles are rapidly becoming popular to homeowners. They are known for their sound and noise control and reduction. The ceiling occupies a significant space in your home, and it’s an integral part of your house. When installing a ceiling for your home, you have to factor in various factors that will enhance its functionality and aesthetics. It should add value and enhance the space and make it more practical. Acoustic ceiling tiles are hung in a framework of metal strips known as drop ceiling. Also referred to as suspended ceiling, they are easy to install. The metal strips are usually suspended from the actual room’s original ceiling, and the individual tiles of sound-absorbing material are hung in each of these sections. This kind of ceiling enhances the acoustical characteristics of a home, absorbs and dampens noise to create and an ambient and quiet environment among many other benefits. Acoustic ceiling tiles usually consist of two main parts which include grid and tile. The grid is fastened on the walls in an overlapping pattern of beams. The beams are designed like shelves to support the tiles hence suspending them directly overhead. In larger rooms, the grids will require additional wires for support. Acoustic tiles are available in two common sizes: 2’x2’and 2’x4′. They are made of mineral fiber, plastic, metal, tin, composite, wood, and fiberglass. During installation, each tile is usually installed one at a time on to the support of the grid framework. Acoustic ceiling tiles were originally used by interior designers whose aim was to lower the ceiling height and dampen the noise. However, the installation of acoustic tiles has become popular with time, not only for its noise reduction feature but also because of many other advantages and benefits. If you are debating on whether to install acoustic ceiling tiles in your home, you should read this guide to learn the benefits associated with acoustic ceiling tiles and the reasons why you should consider installing this type of a ceiling. Perhaps this is one top benefits of installing acoustic ceiling tiles. Your ceiling is one of the places in your home that reflects sound. Just the same as your floors and walls, the ceiling is also a part of the flat surface that is relatively large. For this reason, it is more likely to reflect sound down to your living space. With floors, you can simply add a rug or carpet flooring and furniture to dampen the noise. However, you cannot do this with your ceiling space, and that’s how acoustic ceiling tiles come into the picture. Ceilings are usually flat and smooth which makes it easy for sound amplification. Acoustic ceilings provide acoustic characteristics and reduce noises and sounds from above floors significantly. A drop or suspended ceiling acts a soundproof and dampens surrounding sounds to create an ambient environment. It can be difficult and unsettling to concentrate on anything in your home if there are lots of noise and sounds going on around you. For example, if you live in an apartment where there are lots of people around you, you are more likely to hear unnecessary noises such as steps on the floors, sounds from falling objects, and conversation. Acoustic ceiling tiles act as a form of soundproof and diffuse and absorb unnecessary noise. This kind of ceiling is also great for rooms such as bedroom which require less noise especially sounds coming from the other parts of your home. Also, acoustic ceiling tiles come in handy in situations where you want to hear every bit of sound coming from a piano or the system. Suspended ceilings are a guaranteed solution to unnecessary sounds and noises. This type of a ceiling is not only beneficial to music halls, its practical for anyone looking to have a peaceful and quiet environment in their home and office. It creates an ambient atmosphere to allow you concentrate on your tasks. Acoustic ceiling tiles are ideal for basements, home theater, bedrooms, and home office. In addition to dampening sounds, acoustic ceiling tiles are aesthetically appealing. They are available in a wide variety of decorative materials, designs, texture, finish, color, and styles. They can be designed to complement the rest of your home seamlessly. You can opt for a rough texture depending on the kind of appearance you want your ceiling to reflect. The tiles can also be imprinted with decorative designs and patterns on them to enhance your style and taste further. They can also be painted with a color of your choice to match the ceiling with the rest of your home’s décor or create a beautiful contrast that complements the overall appearance of your home. In addition, acoustic tiles can easily be customized to reflect the design of your home without doing a major renovation. You do not have to bring down your entire ceiling to achieve a new look; rather, you can easily install acoustic ceiling tiles and make a difference instantly. One of the greatest advantages of installing suspended ceilings is their ability to hide and conceal unsightly and exposed structural and mechanical works such as ductwork, pipes, wiring, plumbing, and cables. This type of ceiling tiles leaves you ceiling space looking clean with a minimalist effect on the surface. It also improves the appearance of your home and makes your ceiling area to appear neat and organized. The flexibility of acoustic ceiling tiles allows you to have easy access to wiring, cables, and pipes during repairs and renovations. The tiles allow an easy entry through a slot out making it easy to access the ceiling space. The slot out can easily and neatly be put back into its original place after you are done with repairs. Acoustic ceiling tiles are quick to install compared to other ceiling options such as drywall. The installation only requires simple tools, metal grids that will support the tiles, and acoustic ceiling tiles. In fact, acoustic ceiling installation can be a DIY project if you have time on your hands. If you are a DIY enthusiast, this is a task that you can easily deliver. In addition, acoustic ceiling tiles are one of the only ceiling options that are flexible to changes after installation. If you want to change your existing ceiling to a new one, you can buy new tile and replace them with old ones. This will instantly change your ceiling space and spruce it up without tearing down your entire ceiling. Acoustic ceiling tiles reflect light which allows you to get the most out of your lighting system in a room. They reflect light back into the space meaning you might not necessarily have to install a lot of lighting if you have Acoustic ceiling tiles. With this kind of a ceiling, you could eventually save a substantial amount on utility cost since you will not have to install more lighting, especially in large spaces. Acoustic ceiling tiles are made of materials that are resistant to mold and moisture. This is the reason why this type of ceiling is particularly ideal in areas with high humidity levels such as basements, kitchen, and bathroom. Some acoustic ceiling tiles are manufactured with a coating loaded with antimicrobial treatments to prevent the growth of bacteria and mold. Installing acoustic ceiling tiles technically lowers your ceiling height which in turn provides extra insulation. Ideally, with acoustic ceiling tiles, you have less space to heat which in turn lowers your energy bills. In addition to creating a reflective surface, acoustic tiles are energy efficient. They will brighten up a room and create an illusion of a bigger space while at the same time providing exceptional insulation. Acoustic ceiling tiles are an affordable ceiling option compared to some other types of ceilings. Installation labor costs of acoustic ceiling tiles come at a lower rate than the construction of various types of ceilings. Additionally, the materials required for installation are relatively affordable. If you are looking for a ceiling option that will not make your budget go overboard, but will still manage to give you an appealing look, acoustic ceiling tiles should be your choice. Acoustic ceiling tiles are made of materials that can withstand fire to some extent. Even though the ceiling might not be completely fire-proof, it can help reduce the fire from spreading. In case of fire, acoustic ceiling tiles can offer protection against the fire for about an hour or so giving the occupants time to evacuate. When purchasing acoustic ceiling tiles, it’s essential to find out about the rating of the tile material. If possible, get a class A rated tile material. In addition, look out for the fire barrier rating. The best rating ranges from 0-25 and the lower the fire barrier rating number, the better the ceiling tile. These are some of the benefits of installing acoustic ceiling tiles. However, there are some drawbacks associated with acoustic ceiling tiles that you should know. In case this kind of ceiling gets wet, its likely to get ugly looking stains and if the water pools on top of the ceiling it can fall unexpectedly. A stained acoustic ceiling tile can look unsightly and unattractive. However, you can bleach the tiles to bring them back to the original look if they get water damages. In addition, acoustic ceiling tiles are easy to replace, and if a few tiles get stained, you can replace them with new ones at a relatively affordable cost. The most commonly used acoustic ceiling tiles are in sizes of 2’x2′ and 2’x4′. If you are installing acoustic ceiling tile system for a room of about 10’x12′, it will cost you an average cost of about $1,000 to $1,700. A contractor will charge you from a range of $2 to $5 per square feet as labor charges for installation of acoustic ceiling tiles. Level You need a laser or carpenter?s level to ensure accuracy during installation of acoustic ceiling tile system across the room. For this guide, we will examine the requirements, materials, and costs of installing acoustic ceiling tile in a 10’x12’room. This kind of ceiling installation job is suitable as a DIY project, and you can actually save about 75% of the overall cost of installation if you DIY. The reason why installation of acoustic ceiling tiles is considered possible for DIY it’s because the grid work is usually leveled as you install them. In case of any uneven joists or sagging ceilings, you can easily conceal the imperfections with the installation, and you may not require an involving carpentry work. However, as you plan on DIY acoustic ceiling tiles installation, you should note that the job will be a bit involving even though its considered as an easy job. You will need to work on top of a ladder for long hours and lots of labor time to prepare and set up. In addition, the process of leveling the gridwork can be time-consuming. Some people find it better to hire someone to the installation, but if you are up for the task, you can easily handle the installation on your own. The additional work you are likely to encounter during the installation of acoustic ceiling tiles will be removing an existing grid work and ceiling tiles since it’s impossible to install a new ceiling over an older one. Also, if any suspended light fixtures are fixed through the sheetrock or the ceiling tiles, they will have to be removed before you the installation project. Additional costs might come about in case you need electrical wiring job done, or you need to install vents, lighting, and other features that will require an electrician or an HVAC contractor. The installation process will require grid work from where the tiles will be suspended and installed. For a proper grid work, you will require several main beams and cross beams to go across the walls in a crisscrossing pattern. For 10’x12′ room, you will require six beams each at a length of 12 inches which will cost an average cost of $7 each. You will require 12 cross tee sections measuring 24 inches, and each will cost around $1.50. To complete the installation, you need the tiles themselves. For a room of 10’x12,’ you will require 2’x2’ acoustic ceiling tiles. The case will list the number of tiles you will need to cover specific square footage. The type of ceiling tile you choose will affect the cost of tiles. A simple white acoustic ceiling tile without intricate patterns will not cost you much. A basic tile will have minimal mineral fiber with a low fire rating. If you are remodeling your home, you can spruce up your ceiling space by installing acoustic ceiling tiles. These tiles come with a host of benefits especially for a homeowner who is refinishing a basement. It is a relatively an inexpensive installation that adds acoustical characteristics to a room and dampens unnecessary sounds and echo created by walls and floors. 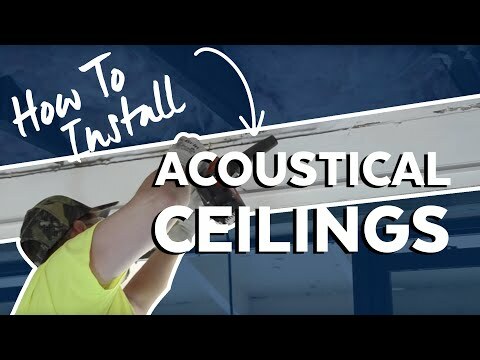 To successfully install acoustical ceiling tiles, you need to plan adequately and gather all your tools and materials to the site to avoid unnecessary inconveniences. On a graph paper, draw the layout of the room to scale. You can use 2’x2’or 2’x4’’ pattern as you prefer. The size of the pattern you will determine the ration of your ceiling. Each pattern size creates a different appearance. Do not limit yourself to one layout. You can try various layouts to see how your ceiling will come out with each of them. As you draw the layout, make sure you space the cross tees to ensure that the tiles at the borders of the room are also equal and big. If you are using 2’x4’pattern, make sure you space the 4ft cross tees with a 2feet space. If you settle for 2’x2’pattern, you should add up a 2-foot cross tee in between the intersection point of the 4foot cross tees. If you are planning to have a recessed ceiling with built-in-lighting you need to identify the light tiles and mark them on the graph paper. In addition, make sure you determine the height of the ceiling. You should leave a minimum space of about 3 to 4inches between the new tile ceiling and the old existing ceiling. If you are installing recessed lighting, you will require an additional clearance to accommodate the lights. Once you locate the position where you will install your acoustic ceiling tiles, you will need to use the level to draw a line all around the room. Make sure you indicate the position where the wall angle will be attached. This step is essential, and you should not assume that the existing ceiling is in level. Nail the wall angles to the studs, or you can use any other fasteners to secure them to the studs. Make sure the wall angles are on the level line that is drawn on the wall. On the inside corners ensure that you overlap the wall angles as you miter the wall angles at 45 degrees on the outside. If you are planning to have recessed lights installed, you should install the wires before you install the tiles. You should use 2’x2′ or 2’x4’drop in lighting fixtures when installing recessed lights. Main tees should run at right angles in the direction of the joists in the ceiling space. You need to identify the exact position of the main tees. Stretch a line from the edge of wall angle at its top on each side of the room right at all positions of where the main tee is positioned. Proceed to cut the suspension wires to the right length. To be certain that you have the right length of the suspension wires, ensure that they are about 12 inches longer than the specified distance between the new string that will guide you and the existing ceiling. Check your sketch on the graph paper to identify the first suspension wire for every main tee above the spot where the first tee comes in to contact with the main tee. Ensure that the suspension wire is securely attached by nailing or screwing or drilling them. If you are not sure about the spacing, you can check the grid manual. Follow the main center line to install your main tees. This will allow you to level the main tees with the wall angle that has already been mounted. Install the cross tees by inserting their ends into the main slots of the main support tees. You can follow the instructions on the grid package to find out about the placement of cross tees into the right position. Following your layout plan on the graph paper, install the first tiles in the first corner. Position the tiles by titling them a bit and then lift them slightly above the grid framework and then allow them to fall back smoothly into place. If necessary, you can cut the tiles into a fitting size using a utility knife. Using a drywall saw, cut appropriate walls where light fixtures will be installed. Acoustic ceiling tiles can spruce a room and dampen unwanted noise from your surroundings. Unfortunately, the ceiling can get dirty, dusty or stained. This can hugely affect the appearance of your ceiling negatively. Let’s face it; a dirty or dusty ceiling can look dingy, less aesthetically appealing and it wouldn’t be something you want to see in your home. Admittedly, people tend to pay less attention to ceilings as they do with floors until they become noticeably dirty or stained. But, your acoustic ceiling does not have to get to this point if you maintain and clean it regularly. Cleaning you acoustic ceiling tiles regularly can actually make them last longer, maintain a healthier air circulation system and most importantly, perform better in soundproofing. Here is all you have to do to maintain your acoustic ceiling tiles to and keep the tiles looking magically new and appealing all the time. Once you install your acoustic ceiling tiles, you might think that’s it, and probably the thought of having the ceiling cleaned may not cross your mind. But the truth is, your acoustic ceiling tiles should actually be cleaned periodically, that is; every two to four years. The cleaning should be done by commercial cleaners to ensure quality services and a thorough cleaning job. Your acoustic ceiling tiles, just like your floors can accumulate dust and dirt on tiles with time. As a result, the tiles might get stained, and the dust might become the cause of allergy problem in your home. Fortunately, things do not have to get this bad with your ceiling. Regular sweeping and vacuuming will get rid of debris and dust. However, before you start vacuuming or sweeping your ceiling, you should cover your furnishings to protect them from dust and the falling debris. Sometimes your acoustic ceiling tiles can get small stains that are not cleanable. If this happens, you do not have to start thinking about an expensive tile replacement. The answer to this is actually simple. You can resolve the stain issue by safely covering up the spot using a product that is designed to protect the acoustical qualities of the ceiling and maintain the fire ratings of your acoustic ceiling. You should beware that painting your acoustic ceiling tiles to cover up the stains is not recommended at and it’s not the answer. Painting with an interior paint can spoil can and destroy your ceiling tiles. Painting can affect the fire rating of the tiles and fill in the tile fissures and ultimately affect the acoustical performance of the ceiling. In addition, scrubbing off the stains is also not encouraged as this might also damage the acoustical properties of the tiles. If you scrub off something from tiles that should not be scrubbed, you might void the manufacturer’s warranty. As a result, the manufacturer might not help much if the product doesn’t live to the expected performance due to the alterations. The HVAC unit in your home can sometimes trap dust particles which could make it generate static electricity. As a result, it may cause the dust particles to get attached to the ceiling tiles. To avoid this from happening, the solution is to make sure you schedule for a professional annual duct cleaning. Another thing is to make sure filters are regularly replaced, and any broken parts of the HVAC system are repaired promptly to avoid an inefficient operation. This will ensure that there is circulation of quality air in the room which will, in turn, make your ceiling stay cleaner for a longer period. When Should You Replace the Tiles? There is no denying that a stained ceiling is unattractive and unappealing. If the tiles have extensive water damages that have formed ugly stained that cannot be solved by a minor cover up, you need to consider a replacing the damaged part. Remember, water stains can actually harbor mold or mildew, and so it would be cost-effective to handle the situation early. If the stained patch looks really bad, you should consider replacing it. This will improve the visual aspect of your acoustic ceiling tiles and enhance its performance. Acoustic ceiling tiles are eye-catching, absorb excess noise and generally create a pleasant, peaceful atmosphere. But that’s not all. This type of ceiling tiles has many other advantages as well. They work best to conceal pipes, wiring, and ductwork creating a clean and organized ceiling surface. More so, they are incredibly easy to install, fire resistant and humidity resistant. The tiles can easily be replaced in case of water damages. Even better, they are available in decorative patterns, and you can choose a color that goes best with your interior décor. Acoustic ceiling tiles are an economical way to spruce up and finish a room. They are easy to maintain, and their installation is relatively affordable.